My husband is a bit of a techie, he loves having the hottest new tech gear so each year I try to find the perfect new tech gift for him. This year, I topped it! 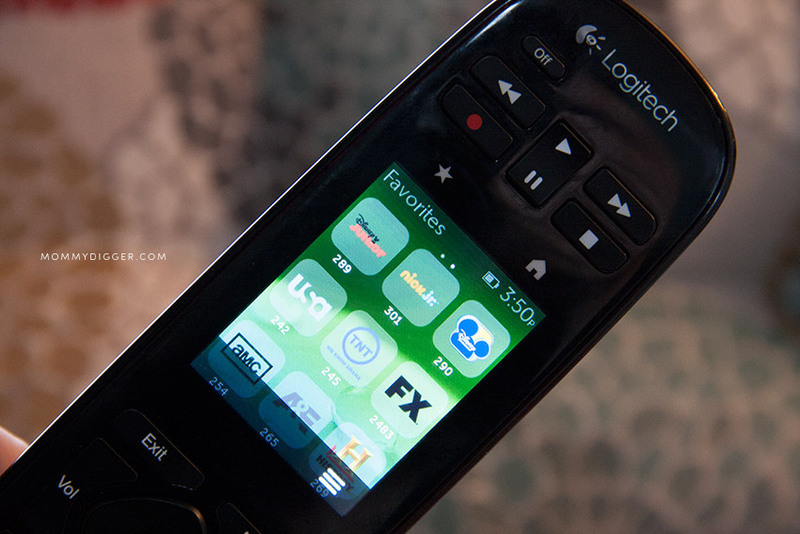 We’ve always had Logitech remotes because we love the ease of use and setup and when I saw the new Logitech Harmony Remote and was offered the opportunity to review it I was super excited. My husband would love it! The Logitech Harmony Touch remote is a powerful remote that takes all of your home entertainment and makes it seamless all using one remote. It has a touch screen that you can swipe, scroll and tap to control all your devices and change channels. You can also personalize it with up to 50 of your favorite channels. Setting up our Logitech Harmony Touch remote was easy. Once you take it out of the package just hook it up via USB to your computer, visit myharmony.com and create an account and customize it for your TV and any additional components. In under 5 minutes we were able to start using our remote. When the remote arrives it needs to charge. It comes with a nice docking station that you set it on and it can charge. It does require charging every week or so so having this doc is super handy. We just set ours on it each night to recharge itself. The remote is very easy and intuitive to use. It’s also really slim so holding it in one hand and selecting buttons is easy and comfortable to do. My favorite feature by far of this remote is the favorites screen. You can customize your favorite stations and the favorites screen will display a large icon of the stations logo that when pressed it will automatically turn to the station. This is great because we are constantly forgetting what station number each channel is and now we don’t have to forever surf through the stations to find the one we are looking for. If you want to go to a specific channel you just swipe the touchscreen over and the number pad is ready for use. The buttons are back-lit so when your watching a show or movie in the dark or dim lighting you can easily make out the buttons without squinting. This is nice for us because our house is so open that when my husband and I watch movies once the girls are asleep we keep the lights dim because of how open our home is in efforts to not wake them. Our Logitech Harmony Touch remote is perfect for our family. We can all watch all of our favorite channels with a quick press of a button, it’s easy to use and I love that we don’t have to buy batteries for it! For all the latest news, updates and promotions from Logitech follow them on Facebook and Twitter. BUY IT: The Logitech Harmony Touch remote is available on the Logitech website, Amazon and in stores. I received the Logitech Harmony Touch remote to facilitate this review. All thoughts and opinions are my own. Wow I haven’t seen a touch remote like this before! My husband is an avid TV watcher, so I think he would like to have this remote because it would be easier for him to see in the dark! I would love to have this. Love that this remote is touch screen and nice that it doesnt take batteries. I like the favorites screen and the backlit keypad. I wouldn’t use this because I don’t have a TV. This is very similar to the one we have. We love ours! It’s the best remote ever. What I love about it is that it is so user friendly. The kids can use it and not get the TV messed. This looks really nice! I love the touchscreen and I think the favorites section is very nice. Thank you for sharing! He certainly did, we just switched cable providers too and it’s been a lifesaver finding the channels! We currently use no less than four separate remotes on our upstairs TV. I’ve always been a fan of Logitech products, so I’ll pass the info onto my gadget guy husband to see if something like this could simplify the A/V setup! My brother would really use this. Neat gadget.